In any development language, there usually arise certain traditional programming styles. The styles are not part of the language itself but are conventions concerning, for example, how variables are named or how certain classes, methods, or functions are used. If most developers using that language follow the same conventions, it makes it easier for different developers to understand each other’s code – which in turn generally helps program maintainability. 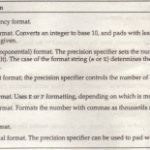 For example, a common (though not universal) convention in Visual Basic 6 was that variables that represent strings have names beginning with lowercase s or lowercase str, as in the Visual Basic6 statements Dim s Result As String or Dim str Message As String. Conventions do, however, depend on the language and the environment. For example, C++ developers programming on the Windows platform have traditionally used the prefixes psz or lpsz to indicate strings-char *psz Result; char *lps zMessage; -but on Unix machines it’s more common not to use any such prefixes: char *Result; char *Message;. You’ll notice from the sample code in this book that the convention in C# is to name variables without prefixes: string Result; string Message;. variable name when data he variable represents ..Hungarian notation is widely regarded as redundant in these days of smart Editors and IntelliSense. Whereas, with many languages, usage conventionly evolved as the language was used, with C# and the whole of the .NET Framework, Microsoft has written very comprehensive usage guidelines, which are detailed in the .NET /C# MSDN documentation. This should mean that, right from the start, .NET programs will have a high degree of interoperability in terms of developers being able to understand code, The guidelines have also been developed with the benefit of some 20 years’ hindsight in object-oriented programming, and as a result have been carefully thought out and appear to have been well received in the developer community, to judge by the relevant newsgroups. Hence the guidelines are well worth following. programs. In many cases, following the conventions would have shade our samples harder, rather than easier to follow . The full guidelines for good programming style are quite extensive. This section is confined to describing some of the more important guidelines, as well as the ones most likely to surprise you. 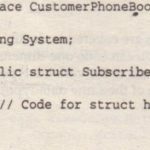 If you want to make absolutely certain that your code follows the usage guidelines completely, you will need to refer to the MSDN documentation. One important aspect to making your programs understandable is how you choose to name your items – and that includes naming variables, methods, classes, enumerations, and namespaces. It is initiatively obvious that your names should reflect the purpose of the item and should not clash with other names. The general philosophy in the .NET Framework is also that the name of a variable should reflect the purpose of that variable instance and not the data type. For example, height is a good name for a variable, whereas integer Value isn’t. However, you will probably feel that that principle is an ideal that is hard to achieve. Particularly when you are dealing with controls, in most cases, you’ll probably be happier sticking with variable names like confirmation Dialog and choose Employee List Box, which do indicate the data type in the name. The following sections look at some of the things you need to think about when choosing names . If you are doing this, you should always use camel casing for the private member and Pascal casing for the public or protected member, so that other classes that use your code see only names in Pascal case (except for parameter names). You should also be wary about case sensitivity. C# is case sensitive, so it is syntactically correct for names in C;#to differ only by the case, as in the previous examples. However, you should bear in mind that your assemblies might at some point be called from Visual Basic .NET application dens – and Visual Basic .NET is not case sensitive. Hence, if you do use names that differ only by case, it is important t:>do so only in situations in which both names will never be seen outside your assembly. 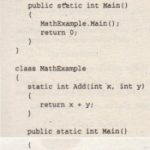 (The previous example qualifies as okay because camel case is used with the name that is attached to a private variable.) Otherwise, you may prevent other code written in Visual Basic .NET from being able to use your assembly correctly. You should be consistent about your style of names. For example, if one of the methods in a class is called ShowConfirmationDialog (),then you should not give another method a name like ShowDialogWarning () or warningDialogShow ().The other method should be called ShowWarningDialog(). no nsk of clashes with C++ keywords. However, you are more likely to have problems with Visual Basic .NET, which has many more keywords than C# does, and being non-ease-sensitive means that you cannot rely on Pascal-style names for your classes and methods. Client code should be able to read its value. Write-only properties are not recommended, so, for example, use a Set Password () method, not a write-only Password property. Reading the value should not take too long. The fact that something is a property usually suggests that reading it will be relatively quick. Reading the value should not have any observable and unexpected side effect. Further, setting the value of a property should not have any side effect that is not directly related to the property. Setting the width of a dialog box has the obvious effect of changing the appearance of the dialog box on the screen. That’s fine, because that’s obviously related to the property in question. It should be possible to set properties in any order. In particular, it is not good practice when setting a property to throw an exception because another related property has not yet been set. 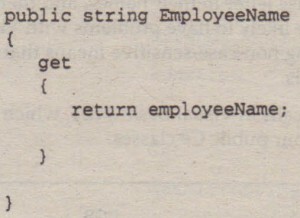 For example, if in order to use a class that accesses a database, you need to set Connection String, User Name, and Password, then the author of the class should make sure the class is implemented so that the user really can set them in any order. .
Successive reads of a property should give the same result. If the value of a property is likely to change unpredictably, you should code it up as a method instead. Speed, in a class that monitors the motion of an automobile, is not a good candidate for a property. Use a GetSpeed ( ) method here; but, Weight and Engine Size are good candidates for properties because they will not change for a given object. If the item you are coding satisfies all of the preceding criteria, it is probably a..good candidate for a property. Otherwise, you should use a method. The guidelines are pretty simple here. Fields should almost always be private, except that in some cases it may be acceptable for constant or read-only fields to be public. The reason is that if you make a field public, you may hinder your ability to extend or modify the class in the future. The previous guidelines should give you a foundation of good practices, and you should also use them in conjunction with good object-oriented programming style. A final helpful note to keep in mind is that Microsoft has been fairly careful about being consistent and has followed its own guidelines when writing the .NET base classes. So a very good way to get an intuitive feel for the conventions to follow when writing .NET code is to simply look at the base classes how classes, members, and namespaces are named, and how the class hierarchy works. Consistency between the base classes and your classes will help in readability and maintainability. 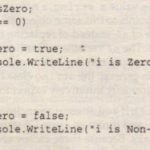 You.have seen that although C# syntax is similar to C++ and Java syntax, there are many minor differences. You have also seen that in many areas this syntax is combined with facilities to write code very-quickly, for example high-quality string handling facilities. C# also has a strongly defined type system, based on a distinction between value and reference types. Chapters 3 and 4 cover the C# object-oriented programming features.